Virgilio Rodriguez Rivera Sr. obituary. Carnes Funeral Home. Virgilio Rivera, 83, passed away peacefully on February 29, 2016 in Houston, Texas. He was born in Manilla Philippines on September 10, 1932 to parents, Dominador Rivera and Patrocinia Rodriguez. 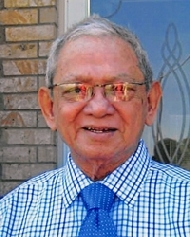 He was a Doctor of Dental Medicine in the Philippines, long time resident of Galveston, TX and retired from University of Texas Medical Branch. He is preceded in death by wife, Marcela Rivera. Survived by children, Virgilio Jr. and Rosa Rivera, Drs. Rosemarie and Reynaldo Garza, Dorothy and Antonio Diaz, Dr. Joel and Adora Rivera, Leslie and Erwin David and Dr. Maria Lourdes and Jomar Patawaran. He is also survived by numerous grandchildren, great grandchildren, nieces and nephews. Acting as Pallbearers will be Dr. Reynaldo Garza, Jomar Patawaran, Erwin David, Reginald Velasquez, Bobby Garcia, and Justin Patawaran. The family would like to express appreciation to all of their friends and family, staff of UTMB, MD Anderson, Fathers Larry Wilson and Paul Felix, and Monsignor Diokno, who have supported them in this difficult time. Funeral Mass will be Celebrated 10:30a.m., Thursday, March 3, 2016 at Shrine of the True Cross Catholic Church, 300 FM 517 East, Dickinson, TX 77539 with the Rite of Interment to follow at Mt. Olivet Catholic Cemetery.